It was a slightly longer report in 1972-’73, “In the University Road Race there had been 146 starters. The race had been won by Doug Gunstone in 25 min 21 sec. His brother John was the first of the Hares and Hounds to finish: he was tenth in 26 min 09 sec.” “Beginning his President’s Report, Jim Bogan said that funnels had been rendered unnecessary for the University Road Race because of a marvellous invention called a tape-recorder, and by deleting certain octogenarians from the list of race officials.” 1973-’74: “One hundred and seventy runners took part in the club’s own Road Race held on a dreadful wet and windy day. Prizes, provided by GUAC were awarded for the first time. Neil Morrison of Shettleston Harriers set a new course record of 24 min 48 sec.” In the next two years comments were restricted to listing the places of the top few GU runners and a comment that the race had higher numbers than before with the credit belonging to Jim Bogan. 1975-’76 was a significant year as will be seen form the second half of this report: “The University Road Race attracted another record entry (201 runners) and was won by former Hares and Hounds member, Dave Logue in 24 min 51 sec, while a current (nameless and obviously legless) member was last. For the first time an entry fee (10p) was charged.” So for more then ten years, the race had been free to all who would run in it. It took three years longer for them to introduce entry fees than it did to offer prizes to runners. But further through the Minute for 1979-’80 comes a very significant entry. “Jim Bogan thanked members of the Hares and Hounds for all the help they’d given him with the University Road Race. However he was unenthusiastic about looking for sponsorship for the event so that better prizes could be awarded. Jim felt that all most runners wanted was a race and a time. He felt the Club had made the right decision in turning down Scottish & Newcastle’s £50 sponsorship offer. Jim raised the possibility of women taking part in the race, stating that “there were easy facilities for women at Westerlands – and indeed facilities for easy women.” He would look into obtaining the necessary permits for women to participate.” Jim’s perception of what most runners want was actually spot on – lack of prizes had not prevented the Uni 5 becoming one of the very best races in the country in terms of runners numbers and quality. It is fait=r to point out though that there was one dissenting voice – later, under AOCB, Ian Archibald suggested that the size of the Road Race be increased and small sponsorships be sought from several companies. The following year – 1980-’81 – Jim’s suggestion of the having women in the race became a reality. On Saturday 21st March 1981, GUAC organised a Superstars competition and it was here that nine took part in the first ever Chunder Mile. For a description of the event and differing interpretations of its origin, see the ‘Personals’ page that you can reach via the link below. The University Road Race on 7th November had 430 entrants and was won by Graham Williamson (Springburn Harriers) in 24 min 28 sec. There was a successful Disco at Westerlands in the evening which raised £80 for the club funds. The 1987 report was in considerably more detail than was usual at the time. ” The University Road Race was held on Saturday, 7th November, with loads of former members of the Hares and Hounds competing. Five hundred and eight runners finished. The race was won by Adrian Callan in 22 min 26 sec. That evening it was discovered that GUAC had neglected to order a Disco. However Gerry McCann and Graeme Walker saved the night by obtaining one at very short notice. Just over a week later the following piece appeared in ‘The Sunday Times. It was not entirely accurate. ‘Cross country runners are noted for their ability train hard, run hard and – after the completion of a race – drink even harder. But few serious runners in last weekend’s Glasgow University Road Race were tempted by a fringe event held after on the athletic track at Westerlands. The Chunder Mile is a bizarre race in which participants drink a pint of beer, run 400 metres, down another pint and so on until they have covered a mile and guzzled six pints. It occurs to Old Cockburn that the event should be filmed ….. as Carry-outs of Fire”! At the AGM on 2nd March the following year the Captain reported that Tom Gillespie had set a ‘world record’ of 6 min 05 sec for the Chunder Mile! Jim Bogan has been referred to often in this report and he was highly regarded throughout Scottish Athletics as a respected runner, a friend to us all and a forward-thinker. In June 1988 the unthinkable happened. I report it as it appeared in the Minute of the AGM. “A dreadful tragedy affecting the Hares and Hounds took place on Sunday 5th June. While away to Grenoble to attend a wedding, the Club’s President, Jim Bogan, was struck by a car that went out of control; he was killed instantly. Jim had been in the process of setting up a three-year sponsorship for the Road Race with ‘General Portfolio’ via Peter Fleming. Des Gilmore took over the handling of this and it eventually went ahead. The following piece, written by Doug Gillon, appeared in the Glasgow Herald on 8th June. Professor Killed in Alps Accident. One of Britain’s leading figures in Veterinary Medicine has died in an accident in France. Professor Jim Bogan who held the personal chair of veterinary pharmacology at Glasgow University was struck by a car on Sunday while out walking. Professor Bogan had been attending a friend’s wedding near Grenoble. ‘He had announced his intention to go out on the hills but never came back,’ his younger sister Sandra said yesterday. ‘Apparently Jim was walking at the side of the road when a car went out of control, and his head either struck a tree or he was crushed against it. He died instantly.’ Because he was carrying no identification, it was sonly when he failed to check in for his flight home that police were able to confirm the the name of the victim. …….. He also enjoyed a distinguished athletics career, both as a schoolboy, and later during which time he was President of the Glasgow University Hares and Hounds. One of his contemporaries in University athletics was Olympic sprinter and now MP, Mr Menzies Campbell. But it was in middle distance running that Professor Bogan made his mark and when Lachie Stewart broke the Scottish record for the 3000m steeplechase, the then Dr Bogan was one of the early pacemakers. One of seven brothers and sisters, Professor Bogan, a member of Victoria Park Athletic Club, still ran recreationally. One of his lasting legacies in athletics will be the Glasgow University Road Race which he was instrumental in launching several years ago. It was no coincidence that several international athletes have emerged from the College of Veterinary Medicine where students found a sympathetic ear as well as academic stimulus. One of his lasting legacies will be the Glasgow University Road Race, said Doug. An excellent reason for it to continue. 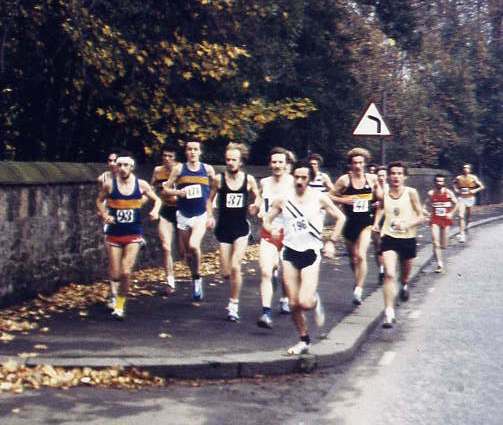 The following year (1988-’89) “The University Road Race was held on Guy Fawkes Day. It was bright and sunny and 522 runners completed the course. The winner was Adrian Callan of Springburn Harriers in 24 min 58 sec. For the first time the race was sponsored by General Portfolio. representatives from the company were along to assist on the day and present some of the prizes. The family of Jim Bogan also attended. A collection from Jim’s family and friends in his memory had enabled the purchase of two trophies for presentation to the first male and female First Claim members of the Hares and Hounds to finish in the race. The trophies were a Jim Bogan Quaich for the men and a Jim Bogan Salver for the women. They were handed over by Sandra Bogam (Jim’s sister) to Tom Gillespie who finished 28th in a time of 24 min 29 sec and to Audrey Sim in 205th position (the second woman to finish: her time was 27 min 31 sec). A superb meal was prepared for the officials and guests by Elspeth Scott’s mother. A most enjoyable Disco was held at Westerlands in the evening during which Phil Ross did the Chunder Mile in 5 Min 40 sec.” The stipulation that the trophies had to go to first claim members was not just a gesture – the University Club has always missed out on good runners preferring to race for their club rather than giving three or four years to the University. The first that I personally remember was Bobby Calderwood of Victoria Park racing for his club all the time he was at University and the problem (if such it were) had been a particularly thorny one in the years that Jim was involved. The club won the Scot Unis Cross Country Championship eight times in a row but several of the very best preferred not to race first-claim for the Hares and Hounds but to remain with their clubs which is understandable. Two outstanding examples are Alastair Douglas who only ran for one year as a member of the Hares and Hounds preferring in the other years to run for Victoria Park AAC and Bobby Quinn of Kilbarchan AAC who elected to stay with his home club. Hence the stipulation. In 1989-’90 it was reported that “The University Road Race attracted 562 runners and was won by Welsh Internationalist Ian Hamer in 22 min 233 sec.” There is a bit more on this race in Alastair Douglas’s comments on the next page. The report on 1990-’91 is another significant one. On Saturday 10th November, 518 took part in the University Road Race which was won by Peter McColgan of Dundee Hawkhill Harriers in 22 min 36 sec. Vicky McPherson in 135th position was the first woman to complete the course: her time was 26 min 45 sec. Elspeth Scott’s Mum and Vicki’s parents provided a superb meal for officials and guests. The Punters had food supplied to them downstairs. The previous evening at Joanna’s and Michelle’s flat in Great George Street, a crowd of the Hares and Hounds had made up filled rolls for sale. Westerlands was packed for the Disco. “The University Road Race in 1994 almost didn’t take place. n the Wednesday before it was scheduled, Michelle Jeffrey received a phone call from the Police to say they wouldn’t be able to supervise the event due to a protest march in the city. They asked could the race be postponed for a couple of weeks or be run on the Sunday. Fortunately Michelle was eventually able to persuade the Police that enough cover would be provided by the Hares and Hounds for the race to go ahead safely. In the evening of Friday 4th November, a large group of Hares and Hounds went along to John Dargie’s flat at Charing Cross to make up rolls. These were to feed the hungry hordes the following day. Because of the good turnout, it took only 50 minutes to get the job done. The Saturday turned out to be cold and wet, nevertheless a good crowd arrived early at Westerlands to construct the finishing chutes, mark the course, etc. Dave Nisbet, who’d spent the year away from University working in industry, arrived to help set up the computers. With the departure of Peter Baxter to Edinburgh, the Hares and Hounds were obliged to do all the organisation for the Road Race themselves this year. Despite the weather 434 finished the race, once again sponsored by BUPA. The start had to be altered due to the new ‘Safeway’ which had been opened on the former site of Barr and Stroud. First home was Phil Mowbray of Edinburgh University in 22 min 18 sec. Former members of the Hares and Hounds, Alan Puckrin (running for Greenock Glenpark) and Bobby Quinn (competing for Kilbarchan AAC) were second and third in 22 min 36 sec and 22 min 41 sec respectively. 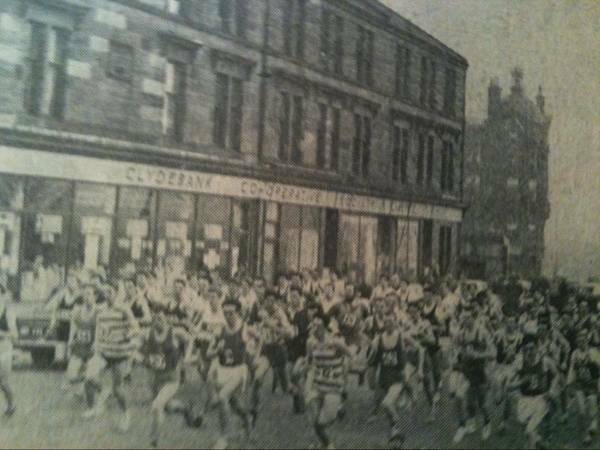 The initial comments about ‘not being able to police the race because of a protest march, was echoed in the early 21st century when it was one of the reasons the Police gave for not wanting the Allan Scally Relay race to go ahead on it chosen and traditional route. If the race in 1994 had had its problems, they were as nothing compared to 1995! “No end of difficulties arose with the University Road Race, all completely outwith the control of the Hares and Hounds. First of all BUPA withdrew sponsorship, then the Scottish Athletics Federation messed up the date, allocating the same day as that for the Allan Scally. When they changed it to a week later it was found to clash with the GUAC Ball. This meant that Westerlands was not available that day. Finally it was decided to hold it on Sunday 12th November. Still problems arose. The Police originally asked that it commence early. Later when they realised 12th November was Remembrance Sunday, the requested that the start (already advertised for 1:00 pm) be delayed. Naturally some confusion resulted for would be entrants. On a cold wet Saturday afternoon several members of the Hares and Hounds turned up at Gordon’s flat to get rolls prepared for the following day. ….. As a result of the Ball, Westerlands was an unholy mess when the Hares and Hounds arrived on the Sunday morning to prepare for the race. Nevertheless everything was eventually sorted out. Plenty of officials and stewards turned up too, and 325 runners took part including 26 members of the Hares and Hounds. The race was again won, in 22 min 18 sec, by former Hares and Hounds member Glen Stewart, now competing for Leslie Deans Running Club in Edinburgh. Glen’s father, Lachie, had won the race exactly 30 years previously. Audrey Sim, who finished 64th in 26 min 44 sec, was the first woman home. The usual Disco was held and a Chunder Mile organised in which a number of ‘Aberdeen Willies’ took part. Everyone seemed toenjoy themselves immensely. It could be called the Glen Stewart Decade – 9 wins ( a treble treble) plus a win in 1993 in the colours of Edinburgh Southern Harriers – with ten wins in thirteen years with four clubs plus an unattached! Graeme Orr in Neilston has sent results of the race between 1984 and 1994 inclusive and the top ten are listed below. I’ll add to the list in due course but for now, the results. After we put up these results, Billy Minto sent those of 1982 and 1983 and these have been added above Graeme’s.